One of my favorite songs of the spring has officially become even better. 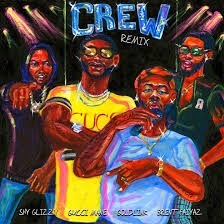 In typical new Gucci fashion, the Atlanta emcee joins with D.C. native Goldlink to assist him on this already killer track featuring Shy Glizzy and Brent Faiayaz. Let’s be real. There are a million and one songs about a groupie girl wanting the whole crew or wanting to be down once she sees the success. But this one is much different. With the soulfully sung hook and the innovative flow on the verses, it sounded so good when I first head it that it took me a while to realize they were even throwing shade. It embodies an emotion that anybody on the come-up wants to express: stay down, don’t try to get down when you see the come up. I’m glad that one of my fave jams is now a whole minute longer. The DMV and ATL have always worked so well together and this remix track is no different. Check it out below.